With The Championships, Wimbledon 2018 being one of the best in recent memory, now is the perfect time to book for the 2019 Championships. After a hugely exciting and unpredictable tournament in 2018 will Novak Djokovic and Angelique Kerber be able to defend their crowns next year or will we see another set of new winners? Top class action at the world's No. 1 annual sporting event coupled with first class VIP Hospitality ensures a great & memorable day for you and your invited top clients. Please note that due to major changes in the VIP Corporate Hospitality offerings at the Wimbledon Championships in 2019 and beyond, a number of the well established hospitality venues will no longer be operating. These include The Fairway Village, The Wimbledon Club and The Lakeview Restaurant. Although not officially sanctioned facilities, all three venues offered excellent services over many years together with Official Debenture Tickets. They will be sadly missed by many companies and individuals who used their services over the years, including many of our own clients. As we wish to continue to offer our longstanding and new clients a top class entertaining facility, together with Official Debenture Tickets, we will in 2019 continue to provide the finest arrangements at Cannizaro House, located just five minutes from the All England Club grounds on Wimbledon Common. This is a well established pre-match entertaining venue for the Championships used by many major corporations, players and sponsors over the years and is owned by the luxury hotel group Hotel du Vin. We do in fact have a long history with Cannizaro House dating back to 1983 when our MD first set up a marquee in the gardens offering VIP Packages to each day of the Championships, with the Men's Final at £395 per person, including a Centre Court ticket! Also having founded the Fairway Village on the Wimbledon Park Golf Course in 1984 and succesfully building it into one of the finest corporate hospitality facilities at any major sporting event, our MD, was responsible for looking after some 3,000+ guests each year. Now under the well established Euro Events umbrella, we are well positioned to continue in providing the best possible facilities, Debenture Tickets and service at Cannizaro House in 2019 and beyond. Our 2019 Wimbledon Championships VIP Hospitality options at Cannizaro House excluding or including Centre/No. 1 Court Debenture Tickets. Please scroll down to see full details of our complete Corporate VIP Hospitality arrangements, schedule of play and costs, plus detailed seating plans for both Centre & No. 1 Courts. 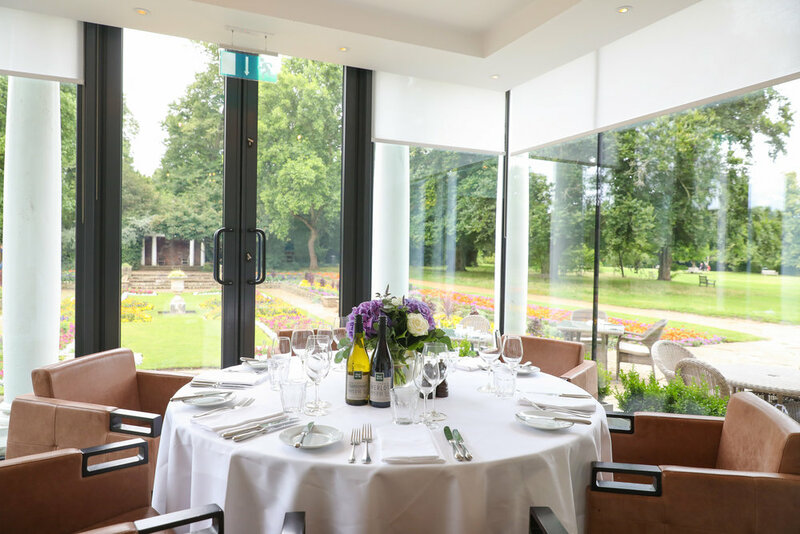 A highly professional service, luxurious surroundings and a prime location in the Orangerie overlooking Cannizaro Park will ensure that you and your guests receive an unrivalled experience delivered to the highest standards. If requiring a private facility for your VIP day at Wimbledon we are able to accommodate parties of 8-12 in the Lallier room, 12-16 in the Opus One room, 20-40 in the Ruinart room and up to parties of 90 in the Krug room subject to availability. Please click here for full details. Before all the action starts on the courts begin your day with a glass of champagne and Pimms on the terrace overlooking the grounds of Cannizaro Park. A daily changing fine three course lunch paired with fine wines created by an award winning chef. Getting to Centre or No 1 Court could not be easier; luxury transfers will ensure an easy passage to the courts. A five minute drive will whisk you from the beautiful parkland setting straight to the All England Club gates. Please note that the transfers to the courts will depart from 12:30/13:30 depending on play & a return transfer will depart from the courts at 19:00 (Return time TBC). Following the day's tennis guests may return to Cannizaro House for a complimentary post-tennis Wimbledon cocktail. Following your complimentary post-tennis Wimbledon cocktail there will be a cash bar available in Cannizaro House. Note, Afternoon Tea can be booked at Cannizaro House for an additional cost. Please contact us for full details and prices. Please note that your Debenture Tickets will allow guests access to the Debenture Lounges on Centre & No. 1 Court, which include bars, restaurants and luxury cloakroom facilities very close to the court. Please note that our costs are subject to change, upwards or downwards, depending on market conditions/demand. Prices do increase, sometimes dramatically upwards on certain days, in the weeks leading up the event. We will do our best to keep the chart below as up to date as possible but would suggest that you check with us by phone or email for any changes before making any firm financial or client commitments. You can call us now on + 44 (0) 333 456 7890. Please note that prices can change upwards and downwards and should only be used as a guide. Please contact us to discuss your enquiry. Please note that all prices are per person exclusive of VAT and are subject to change and availability at the time of booking. Click here to view further details on Official Debenture Tickets Only. To enhance your day at Wimbledon and that of your invited guests, we are able to arrange any of the following add-ons for your party. Special products - food/drink etc. Please contact us for a personalised quotation for your party now on +44 033 3456 7890. Please note that Euro Events London has no affiliation with the All England Lawn Tennis Club. Why not add some extras to enhance your day? The Debenture Tickets on Centre Court are located in gangways 202 through to 210 and also in the first few rows of gangways 301 through to 318. Debenture Tickets on No. 1 Court are located in even numbered gangways 2 through to 36.